Guillaume Moreaus fans found reasons to be cheerful in Pau. They are used to see the driver from Limoges enjoy himself from «Foch memorial» to «Beaumont Park». 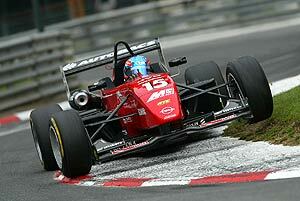 Since his motor racing debuts back in 2002, he has always been competitive and successful in the streets of Pau. But we didnt expect the Signature Rookie to be so high on the result sheets in what was only his second race in Formula 3. Sundays task was harder. But Guillaumes 13th position on the grid had but one effect: an even greater motivation! closer and closer, but not enough to challenge him for 7th place. legendary circuits in two consecutive week-ends: Spa-Francorchamps and Monaco, no more, no less!